We mean wrecking games in a good way. This weekend saw the start of Summer Games Done Quick, a twice-yearly event featuring some of the world's best video game speed runners coming together to break records and beat big bads. The best part, though? They're doing it all for charity. Koopa the Quick must be sooooo mad. The world of speedrunning waits for no one. Super Mario 64 speedrunner Siglemic was already the world record holder for the fastest time in getting all of the game's 120 stars, but he set a new record of 1 hour, 43 minutes, and 54 seconds yesterday. Take some time to marvel at his skills in the game that defined 3D platforming. Just don't get caught in Mido's circle of death. That dude is a jerk. Cosmo Wright set a new world record for completing The Legend of Zelda: The Ocarina of Time in 18 minutes and 51 seconds yesterday, and today, he's back at it and trying out new techniques to get even closer to the elusive "perfect run." You can watch his live stream for a master class in Ocarina of Time. He already shaved seven years off of the game by staying Young Link to the end. How fast can you beat the greatest Zelda game of all time? (Yeah, I said it.) Not as fast as Cosmo Wright, that's for sure. Cosmo was already the world record holder for completing Ocarina of Time in the shortest time, but he just beat his own record with a crazy technique that only works 8% of the time. It's not a hobby. It's important cancer research. What could be better than racing to see if you can get a world record clear time in some of your favorite games? Doing it for charity and saving lives, for sure. Awesome Games Done Quick raised over one million dollars for cancer research last week as players competed in a huge live streaming speedrun event. Oh sure, you could watch Aliens the regular way, but why? Watch this animated speedrun instead. The topic of the Alien movies came up in the office the other day, and I realized I probably haven't watched the first two since high school at the latest. I probably would have wasted hours of my life watch Aliens again, but now thanks to 1A4 Studios I don't have to. They've done a Speedrun version of Aliens that compresses it down to 60 seconds. Thanks! I remember Aliens as kind of boring. Star Wars Episode IV: A New Hope is one of my favorite movies, because it's one of the best ones. At 125 minutes long I don't always have time to sit down an watch it all. Thankfully, it's the latest installment of 1A4STUDIO's Speedrun webseries. This animation compresses the entire film down to a simple minute-long animation. Want to know everything you absolutely need to about Back to the Future but don't have the time to sit down and watch the whole thing? We feel that - after all, it's a busy world these days. 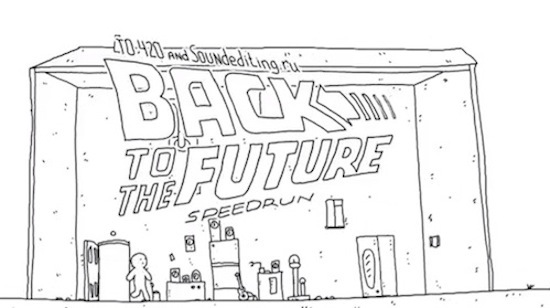 Now, thanks to the animators at 1A4 Studios, you can just check out this speedrun of the classic comedy which doesn't make a whole lot of sense, but still makes about as much sense as Back to the Future. All the requisite thrills, chills, and spills are intact, though it will come together a little better if you have seen the movie like a million times before this. You have seen the movie like, a billion times before this, right? Of course you have. In the X With Friends franchise, Scramble With Friends isn't exactly the favorite, but that doesn't mean it doesn't have its devotees. This guy, for instance, can play so fast he's routinely accused of cheating by other players and claims to have a record high score of 3,700 points. It sounds ridiculous, but when you watch the video, everything becomes clear. He's not actually seeing and identifying words, instead he's guessing letter combos based on possible vowel positioning, and entering a bunch of invalid words in the process. It's sort of against the spirit of the game, but not the rules. Even so, the speed at which he does it is incredible. I hope to someday be half as good at just one thing. Preferably a more useful thing. We post the occasional speedrun from time to time, but this Portal speedrun, performed by a gamer called DemonStrate, only takes 9:25.567 to get from waking up in the bed at the beginning to dropping the last personality core into the incinerator at the end. Moderately adept gamers already know Portal is a fairly short game, taking maybe a little over an hour if played at a casual pace, but under ten minutes? Well, it turns out DemonStrate used a bunch of glitches in the game to complete the speedrun so quickly, including, funnily enough, shooting portals through clipping glitches. I segmented the speedrun per map. This means when the game says, "Loading...", it is loading a new map, and I save the game and load from there. I don't believe anyone else in there [sic] right mind would try to do what I have done in this video. I completed the first segment on September 13, 2008, 06:12 AM and the last segment on July 03, 2010, 08:32 PM. Almost 2 years of working on this. Developed by Cyan, Myst, a puzzle-adventure game that was first released in 1993 then subsequently ported to just about every other platform imaginable, was actually the best-selling PC game of all time until The Sims came along and dethroned the frustrating-yet-fun adventure game (with various other games eventually toppling Myst's record as well). The Myst series is probably best known for being difficult, but that didn't stop YouTube user Guptill89 from completing a speedrun in 1 minute and 45 seconds, which was actually topped by another YouTube user, Arkarian01, because his speedrun was played on a computer that could load faster, which is posted past the break. 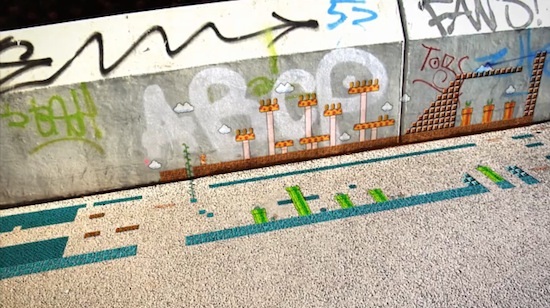 Super Mario-themed fan videos aren't exactly a rare commodity on the Internet, but this one, you've just got to watch and admire: Vimeo user Surfap has posted a remarkable composited video of a Super Mario Bros. speedrun as projected on a sidewalk and a graffiti-covered wall. It keeps scrolling, and scrolling, and scrolling ... seven minutes and a whole lot of wall and pavement later, Bowser is trounced and the Princess is rescued. The handling of the overworld-underground division is an especially nice effect.